The Government of Alberta is supporting hundreds of women and children fleeing abuse or living in poverty by investing in transitional shelter housing in Calgary. 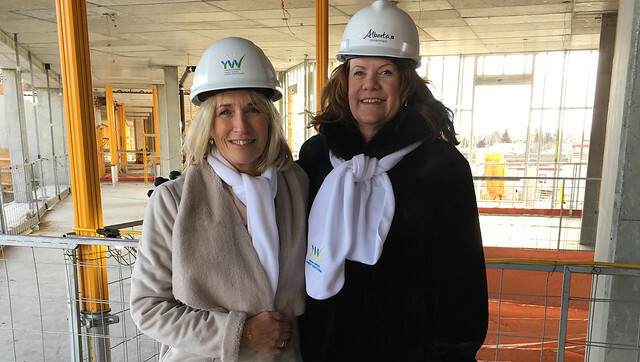 Minister Sigurdson and YW Calgary CEO Sue Tomney at the YW Hub project, which will see 100 new transitional housing spaces for women and children. Seniors and Housing Minister Lori Sigurdson announced $8.6 million of capital funding for YWCA Calgary for construction of 100 transitional shelter homes in their new Hub facility. Once construction is complete, the YW Hub will feature 100 single suites, each with a private bathroom and access to a community kitchen and living space. The facility will provide women with wraparound services such as counselling, employment and training opportunities, as well as 90 childcare spaces. Designed by women for women, YW Hub will become a safe place for clients to stay while they take the first step from crisis to stability for themselves and their children. It is estimated the construction of the YW Calgary Hub facility will create 100 construction jobs over 16 months. Construction has already begun and the facility is on schedule to open in spring 2019. The total cost of the project is $60 million and includes investments from YW Calgary, private philanthropy and all levels of government (currently provincial and municipal contributions have been confirmed and federal funding is under review). YW Calgary is the largest and longest serving women’s organization in Calgary.